Following the onomatoPOWia is a bit odd in this one. 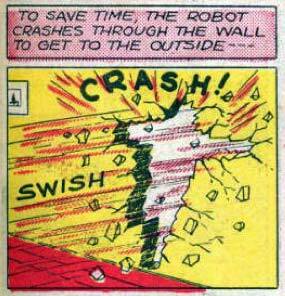 By having CRASH atop the panel, it gets read before the SWISH which precedes it (logically). The SWISH should be higher up, then the CRASH over to the right. It’s funny how mere placement of sound effects can be disruptive to the flow of the action in the panel. ROLFLMAO! Best use of “FAIL” ever!